Forest conversion to oil palm and rubber plantations is a common land-use change in Jambi, Sumatra due to the high economic demand of forest border communities. The environmental effects of such conversions have raised global concerns due to the potential to increase nitrous oxide emissions (N2O) to the atmosphere. To quantify this effect, we conducted a series of monthly N2O flux measurements between July 2010 and August 2011 using a static chamber method in an undisturbed forest, a disturbed forest, a one year old rubber plantation, a twenty year old rubber plantation and an eight year old oil palm plantation. All plantations belonged to smallholders and were usually not fertilized. 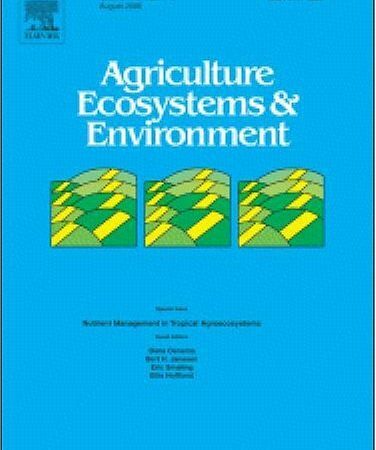 In order to understand the effect of management intensification on N2O fluxes, we applied nitrogen (N) as urea (33.3 kg N ha−1) in the oil palm plantation in April 2011 and monitored the emissions intensively until 28 days after fertilizer application. Nitrous oxide consumption was significant in these weathered soils, accounting for 30% of recorded flux data, although 17% of the negative fluxes fell below detection limits. Most of these happened in the oil palm plantation and undisturbed forest. Annual N2O emission rates amounted to 1.73 ± 0.48, 1.22 ± 0.27, 1.34 ± 0.36, 1.02 ± 0.27 and 1.04 ± 0.39 kg N ha−1 y−1 in the undisturbed forest, disturbed forest, one year old rubber plantation, twenty year old rubber plantation and oil palm plantation, respectively. Forest disturbance and conversion to rubber and oil palm plantation did not significantly affect annual N2O emission rates. However in the oil palm plantation, the amount of N emitted as N2O was high (3.1 ± 1.2% of the fertilizer N applied), so at a typical fertilizer application rate of 141 kg N ha−1 y−1, annual emissions would have amounted to 4.4 ± 1.6 kg N ha−1 y−1, more than twice the emission rate in the undisturbed forest. Dry mass and nitrogen mass in standing litter, distance to the nearest termite nest, rainfall on the day of measurement and air temperature were the key factors that predicted annual N2O fluxes across the land-use change transitions.